Biobased chemicals struggle with low energy prices. If they are drop-ins, they have a hard time competing with petrochemicals. Therefore, the case for new, specifically biobased platform chemicals, gets stronger. This case is demonstrated by companies that concentrate on new biobased chemicals like furandicarboxylic acid (FDCA); and it is supported by science. At the recent Biobased Materials conference in Cologne, Thomas Farmer of York University gave a compelling argument in favour of new biobased platform chemicals. We stated the case for new biobased platform chemicals several times on this website, in different wordings. Try to conserve as much as possible the complexity of biomass and do not reduce the feedstock to simple petrochemicals first, Alle Bruggink wrote two years ago. Do not commit the folly of first removing a lot of oxygen, having to put it back in afterwards, wrote Willem Sederel, like in the mostly petrochemical pathway glucose (C6H12O6) – ethanol (C2H6O) – ethylene (C2H4) – ethylene oxide (C2H4O) – ethylene glycol (C2H6O2). And keep in mind that you may lose an appreciable amount of your feedstock, mainly in the form of CO2, if you try to process your biobased feedstock along the lines of petrochemical logic, we wrote, paraphrasing a report on Biomass Utilisation Efficiency by nova-Institute. But never was the case for new biobased platform chemicals put to me so elegantly as in Dr Farmer’s speech in Cologne. The basis of Farmer’s argument is a graph that maps organic materials on their oxygen and hydrogen contents. Hydrogen being the X-axis, all hydrocarbons are on that axis. Oxygen forms the Y-axis, and hence carbon monoxide and carbon dioxide are on that axis. 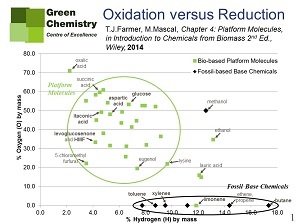 The graph directly shows that both biobased resources and most commercial products contain a considerable amount of oxygen, whereas fossil resources do not. Follies like the one highlighted by Willem Sederel will show as major movements on the graph, and these movements will by their very nature generate chemical waste. Figure 1 shows the representation of fossil-based base chemicals (almost all of them hydrocarbons, with the exception of methanol) and biobased platform chemicals (almost all of them containing oxygen, with the exception of limonene). 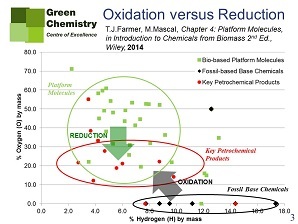 Figure 2 shows that, in order to produce commercial products, fossil-based base chemicals will have to be oxidised, whereas reduction, if at all, is required from biobased feedstock. Now, as every organic chemist knows, this in itself is to the advantage of biobased chemicals, as oxidation is a much more random process than reduction, producing more chemical waste, even with the use of good and specific catalysts. Farmer illustrates his point with cases of new biobased platform chemicals that could substitute common fossil-based chemicals. Issues are: will the new materials, produced from biobased platform chemicals, be competitive on quality and price? And on sustainability (chemical waste, energy use etc.)? 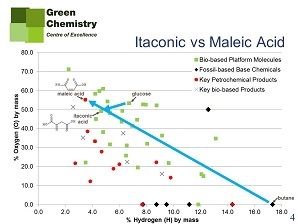 The first example is itaconic acid (biobased) vs. maleic acid (fossil-based). Maleic acid (cis-HOOC-CH=CH-COOH) is very commonly used for the production of unsaturated polyester resins (UPRs). It is produced from butane (see figure 3). Could itaconic acid (HOOC-C(=CH2)-CH2-COOH), easily produced from glucose by fermentation, substitute it? Itaconic acid, like maleic acid, has a double bond, required for cross-linking of polyester chains in UPRs. Farmer and others demonstrated that undesired effects commonly attributed to this substitution may be overcome, and that itaconic acid can produce resins of the same quality as maleic acid. In that case, the huge difference in production pathways may in the long run be decisive in favour of the biobased chemical. 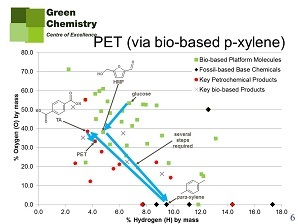 Another example given by Farmer is the production of the well-known fossil-based polyester PET, and its possible substitution by biobased PEF. The main constituent of PET is terephthalic acid, produced from p-xylene. Production of terephthalic acid from petrochemical p-xylene is much like that of maleic acid from butane. Now the drop-in solution would be to produce terephthalic acid from glucose (copying in part the petrochemical production pathway), but one look at figure 4 will tell us that this might not be a good idea. The biobased alternative is the abovementioned FDCA, that will produce PEF, a plastic that is even superior to PET in its properties. Production of FDCA and PEF from glucose is rather straightforward (figure 5). 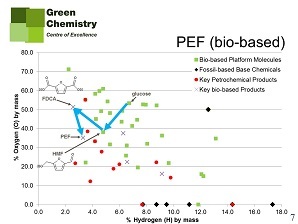 This difference also shows in the Biomass Utilisation Efficiency calculation for both pathways: glucose-to-PEF is much more efficient (max. 87%) than glucose-to-PET (max. 62%). Farmer gives more examples of new properties offered by biobased platform chemicals. He notices that the world is not yet quite tuned to the arrival of new biobased platform chemicals. Existing regulation like REACh in Europe is in favour of drop-ins (that do not have to undergo lengthy testing procedures) over new chemicals. Likewise, producers, markets and consumers are more open to drop-ins. But drop-ins have important drawbacks. Their production from biobased feedstock will remove much functionality, functionality that could be of great advantage to truly biobased platform chemicals. Often, the chemistry of these new chemicals is quite different from that of fossil-based chemicals. But this may have an important upside in opportunities for new IP. And universities, says Dr Farmer, could help to understand this new chemistry.